This post is WAY overdue. After my narrow victory at Settler’s Mill on June 7, Andrew and I arranged for a rematch. We ventured to Armstrong Park on July 5 for the next chapter in our competitive endeavors in miniature golf. Watch highlights from the event. While I was hoping for another down-to-the-last-hole edge-of-your-seat thriller, Andrew dominated right from the start, gaining three strokes on both Dad and me in the first three holes. He demonstrated his skills throughout the front nine, carding a most impressive 21. I shot 26, and Dad shot 27. I had a few moments of brilliance on the back nine, but I could never string enough good shots together to make a dent in the lead. Dad, however, gained two strokes on both of us, bolstered by a hole-in-one on #14. To sum things up, we all had lots of fun, and Andrew demonstrated his amazing putting skills. It’ll be interesting to see if he can emerge victorious in the next match, keeping in mind Dad’s awesome perfomance at Big Bear last month. This post takes us back about a week. On Sunday, August 30, we were in Minnesota, finishing up a weekend of fun with Andrew and Holly and the girls. After a party with tons of people on Saturday, we had some time for fun in a much smaller group. The eight of us (Ben, Jenelle, Andrew, Holly, Ella, Lily, and my parents) went to Big Bear mini-putt, only a short drive away from Andrew & Holly’s house. As with all of our mini-golf matches, Andrew and I tend to be a bit competitive, with me being the perpetual underdog. What we did not expect, though, was the amazing performance by my dad. 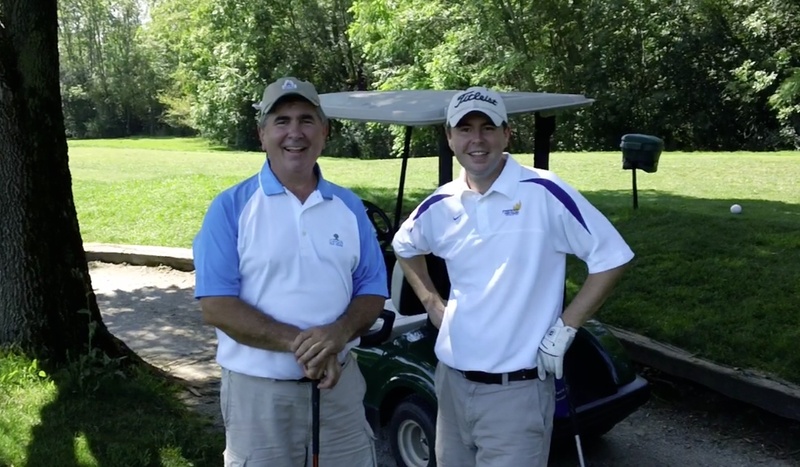 After nine holes, Dad was in the lead with a score of 17, which included three birdies and an eagle. I was in second with 18, and Andrew wasn’t far behind at 20. I should also mention that my dad was playing on one good knee. He had surgery on the other one just this past Friday, and is doing well. Granted, mini-putt isn’t as stressful as full-swinging golf, but on the course, I felt like I was watching Tiger Woods at the ’08 U.S. Open. Andrew and I were hoping to pick up some strokes on Dad on the back nine. It wasn’t to be. My dad did not have an error-free round, but he made some unbelievable shots to cover his mistakes. For example, on a hole with a bunch of rocks guarding the green, his first shot hit the rocks, leaving him on the fairway. His second putt went around the rocks, off the wall, and into the hole for a 2. Too good — Andrew and I just could not compete. 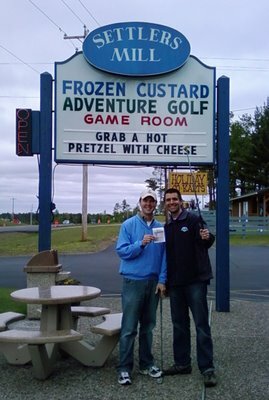 Andrew and I had another mini-golf “showdown” back in early July. I’ll post more on that sometime soon. It was a chilly Sunday in Minocqua, Wisconsin, but it wasn’t too cold for a round of miniature golf. 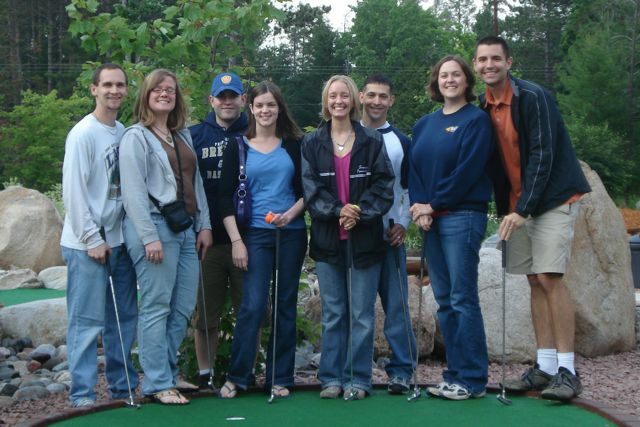 Six of us — myself, Jenelle, Andrew, Holly, Ella, & Lily — took on the course at Settlers Mill. After the front nine, Andrew had a one-shot lead over me. The tough back nine took its toll on everyone, but I somehow managed to stay in the match. I tied things up a few times, Andrew managed to keep his one-shot lead going into the 18th hole. Andrew and I have always had a lot of friendly competitions. With us now living nearly 400 miles apart, we take advantage of opportunities to challenge each other in a variety of games. Andrew beat me in Cribbage on Saturday night. Could he earn another victory at Settlers Mill, in an event which he arguably holds an advantage? The 18th hole has a gentle downslope leading up to a tunnel with rocks at various positions. Inside the tunnel, the surface is bare so that balls should easily roll down to the green and not get stuck. If you hit the ball too hard, there’s a chance it will go into a collection area that makes achieving a two very difficult. Andrew, aware of everything I mentioned above, hit his shot just gently enough to get it down to the green. To everyone’s surprise, his ball struck one of the first rocks and STOPPED just short of the tunnel. This was the golden opportunity I needed to tie things up again. I also hit my shot very lightly. My ball also struck a rock, and it appeared to stop for just a moment, and then it ever-so-gently rolled down the slope, through the tunnel, and stopped a few feet away from the hole. I made the putt for a 2, and the pressure was on. Andrew’s second shot ended up in the back of the green, and he had a tricky putt remaining. As I pondered what kind of “playoff” we could set up, I watched as Andrew MISSED the putt. I finished with a 49 (+5), and Andrew carded a 50 (+6). A rare victory for me. Also, congratulations are in order for Andrew and Holly. Nine years ago today is when Andrew proposed to Holly by the fountain at the center of town in Galesburg, Illinois. Happy Engagement Anniversary!